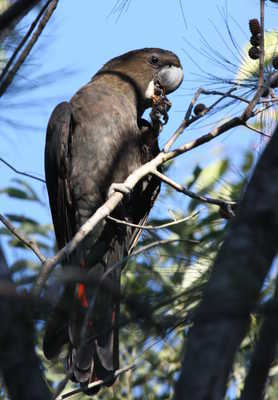 Noosa Council Mayor Tony Wellington says it is solely up to the developer to amend its plans for a high density residential aged care facility and retirement village if it is to consider calls from the community to retain glossy black cockatoo habitat at Sunrise Beach but community group Glossy Team Sunrise say he is ignoring an opportunity to negotiate changes. Plans for the Uniting Care development in Grasstree Court were approved by the Sunshine Coast Council pre-de-amalgamation about a decade ago. Glossy Team Sunrise formed only in recent weeks and have campaigned to prevent the clear felling of habitat of the glossy black cockatoo, regarded as the most threatened species of cockatoo in Australia, and gained more than 2200 signatures of support on its change.org petition. Team spokeswoman Bettina Walter said the group worked hard to meet with Uniting Care and open the lines of communication, telling them they would not stand by and watch Glossy feed trees being cut down. She said the developer told them they regarded the meeting as “a first important step to engage with the local community and saw many advantages in the facility becoming part of the local social fabric”. “The developer representatives stated they had submitted their operational work plan to council and they believed council would now begin community engagement on this project,” she said. However in a letter to the Glossy Sunrise Team Cr Wellington said the operational works plan did not alter the building footprint but was for bulk earthworks to prepare the site. “There is no legislative mechanism for Council to consult publicly on an operational works application,” he said. “Council has no authority nor coercive power to force changes to a preexisting development approval. And I can assure you that Council will not act in a manner that is unlawful or which will bring Council into pointless and expensive legal action, nor that will bring Council into disrepute. Cr Wellington said Council had received a minor amendment from the developer that aimed to conserve some trees. A Uniting Care spokesperson said the project was going through final assessment and they were “committed to meeting all environmental conditions as outlined in the current Development Application”. “We are committed to providing aged care services to the Sunshine Coast community and will continue to work with the community throughout the process of this project,” the spokesperson said. Ms Walter said the team was asking for “people with power and relevant expertise and local stakeholders to come together to sit down and nut out a better solution”. The team plan to meet with Noosa Biosphere Reserve Foundation director Rex Halverson and are planning to hold a community event in the near future at Sunrise Shops. Uniting Care expect construction on the project to be completed by 2022.